Assassins, Inquisitors, and Sororitas, oh my! Take a peek at their 8th Edition Incarnation. GW and Reece are back with another Faction Focus today. This time it’s a look at the Imperial Agents which comprises the Officio Assassinorum, the Adepta Sororitas, and the Inquisition. Let’s begin. 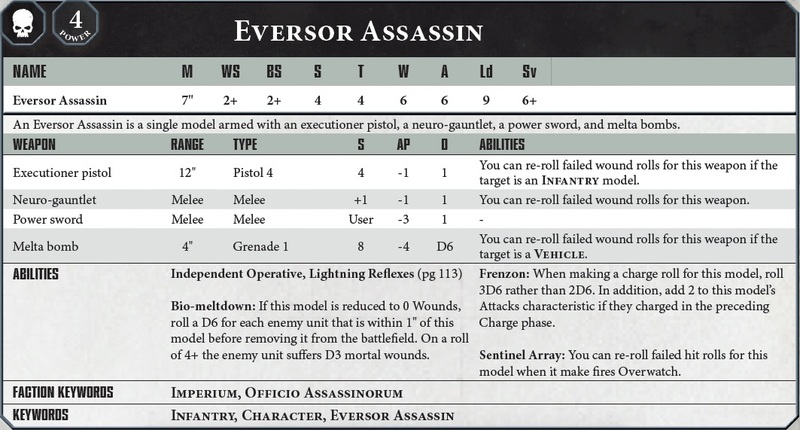 Now how exactly these factions will work in concert with the rest of the Imperium is not exactly clear–but from a quick look at the keywords on the Eversor Assassin’s profile, we can see that they’ve got the Imperium Faction Keyword. And I’d guess the rest of the units in this faction have the same, so you’ll want to keep that in mind while you’re building your forces. The Officio Assassinorum particularly have had quite a ramp up. They all come in at very reasonable points costs for matched play and have interesting and fun abilities. The Vindicare is a truly deadly sniper with his ability to ignore cover and invulnerable saves on a gun that is AP -3 and always wounds Infantry on a 2+ with D3 damage (or D6 on a 6 to wound!). 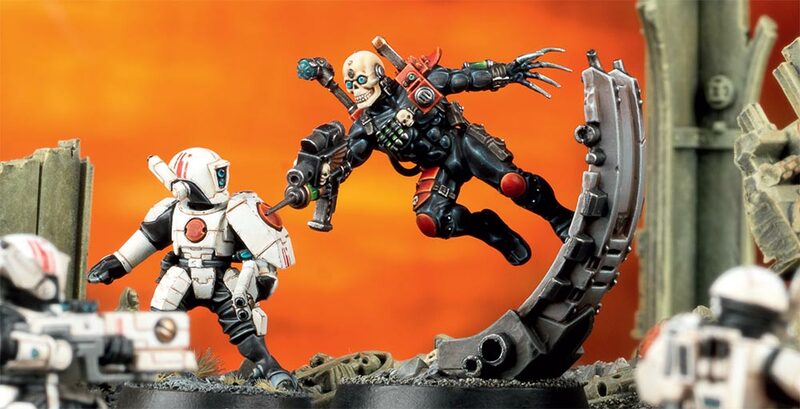 However, the award for most improved goes to the Eversor, who’s always been my favourite of the Assassins. 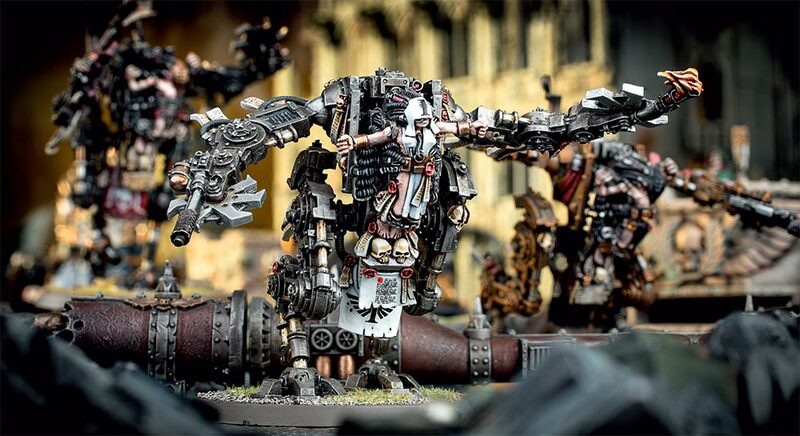 He now can appear from reserves anywhere on the table more than 9″ away from enemy models but charges 3D6″. This seems pretty potent. Especially if they can charge the turn they come in. Basically they can appear out of nowhere and engage your units that really wanted to be shooting next turn and just start tearing into them. Or did you have a unit that was going to be charging? Well now they’re dealing with a 6 wound unit with a Neuro-gauntlet and Power Sword. Oh, and who explodes into mortal-wound-toxins whenever killed. Which is going to make it all the more bittersweet when those triple ones turn up on the charge roll and they get blasted into oblivion next turn. But if you’re worried about Assassins or other deep-striking, infiltrating, shenanigans, there’s always Coteaz out of the Inquisition. The Inquisition also offers a lot of tools for the Imperial player’s arsenal. Many of the same faces are there still, and Coteaz particularly still offers up a great toolset, although it is now much more focused in application. His rule Spy Network (similar to his older rule, I’ve Been Expecting You) now allows you to fire on an enemy unit that is deployed after the game begins — such as Terminators coming in via Teleport Strike — but only with a friendly Inquisition unit within 6″ of him. However, as almost no other units in the game have this ability, it is quite a powerful tactical advantage. I really like this rule–it encourages you to build a list around a theme (the Inquisition Keywords) and can be a challenge to fit it in with the rest of your forces–but it gives you a ton of tactical options as a reward. 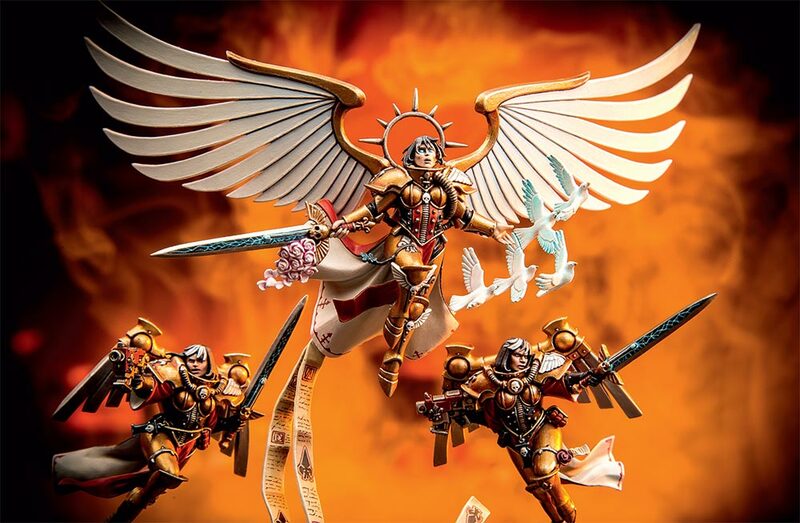 Then of course there are the Adepta Sororitas, who put the Faith in “Faith in the Emperor.” Their new incarnation seems built for them to leverage their core Acts-of-Faith synergies to provide for greater market reach and increased numbers in the 4th quarter. At least according to the latest actionable items from this morning’s drop-in with the new Division Chief. They now boast some powerful tools such as their Iconic rule, Acts of Faith which triggers on a 2+ roll at the beginning of your turn. If you pass, one of your units gets to use an Act of Faith which ranges from a free move, free shooting phase, free round of melee, or the regeneration of D3 wounds for a previously slain model in a unit. This gives you a huge amount of efficiency and flexibility from your units. They all have the very good Shield of Faith rule which not only gives you a 6+ invulnerable save but allows a limited version of Deny the Witch to every unit with it. That said, a single Act of Faith would seem a bit limiting, right? Well fret not, you can get as many as you want. Celestine grants an automatic Act of Faith to a unit within 6″. Imagifiers also grant you an additional Act of Faith to a unit within 6″ on a 4+. Celestine continues the Faithstravaganza by improving Shield of Faith rolls for anyone nearby, and her attendant Geminae Superia. Once per game she can come back at full health on a roll of 2+ when slain, so, on the battlefield she’ll be hot stuff. Speaking of artless segues, here’s a look at the Penitent Engine which is full of literal hot stuff in the form of two Heavy Flamers. The Penitent Engine is another potent vehicle dramatically improved from previous versions. They are improved on a basic level due to the changes to how vehicles work, and they are no longer in danger of getting taken out from a single shot in most cases. Defence aside, they really shine in the offence department. With 2 heavy flamers, they can plow through units and have excellent overwatch capabilities. In melee, they get 4 Attacks at Strength 10, AP -3 dealing 3 Damage each. But where it really gets crazy is when they pile in and attack again in combat on a 4+! You can find all this and more, including a look at the Immolator if you head on over to the full article. In the meantime, start planning your detachments because the Imperial Agents are ready to deploy in the Emperor’s Name. Which assassin are you hoping gets the biggest rework? What do you think of the new Sisters? Will they finally get the book they need in this edition?